“The end of extreme poverty is in our hands!” This is the message that united our brand new team of Youth Ambassadors in Paris with very special guests Bill Gates, Jacky Ido and Cali. Across Europe, we’re launching an exciting new network of 150 Youth Ambassadors for 2014, and our Paris team were the first to burst into life. They will be taking our ONE VOTE 2014 campaign to decision makers and the public, campaigning for candidates in the upcoming European Union elections to put fighting poverty at the top of their agenda. After a day of training with the ONE France team yesterday, the 20 Youth Ambassadors gathered early this morning at the Perchoir, in Paris, for the official launch of the campaign. It was also an opportunity to meet their “sponsors” – ten prominent social media influencers who will support and amplify their activity online during the six month campaign. To the delight of the Ambassadors, three renowned public figures came to support and congratulate them on their actions: Bill Gates, co-president of the Bill & Melinda Gates Foundation, Cali, singer and songwriter, and Jacky Ido, actor and director. Bill Gates explained the progress made in the fight against extreme poverty and pointed out that we have halved it in the last 20 years. During this time, many countries that used to receive aid have become self-sufficient. He also shared his optimistic view for the future with the Ambassadors, emphasising that, with continued focus and investment, they can be the generation to end extreme poverty. The European Elections in May are the perfect opportunity for our Youth Ambassadors to campaign hard for change. As Cali recalled, being the first global contributor to development aid, Europe has an important role to play. He also reminded us that in Brussels, no decision is made without the Member States involved, including France. As the faces and voices of the ONE VOTE 2014 campaign, the Youth Ambassadors will be meeting the candidates to tell them that ending extreme poverty by 2030 is in our hands, but that we need decisive action to make this a reality. 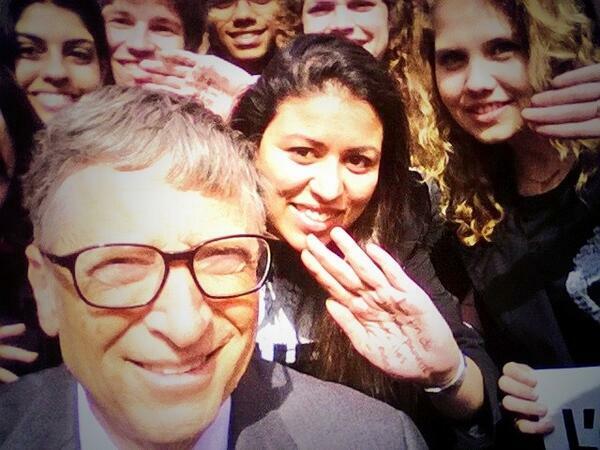 To capture the moment, Bill Gates used his phone to take a selfie with Cali, Jacky Ido and all the Ambassadors and posted it to Twitter. Friederike Röder, Director of ONE France, added that the ONE VOTE 2014 campaign doesn’t stop with the Youth Ambassadors. We’ll need every ONE member across Europe to help get the message out to candidates and you can start by signing the petition. Follow what the Youth Ambassadors are up to on our instant social media feed.